Education is an ‘enabling factor’, which facilitates not only economic betterment but also human freedom. However, for the marginalised, basic education remains a challenge not only due to lack of access, but also because the pedagogy of mainstream education alienates the marginalised. 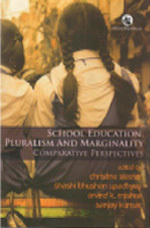 The editors and contributors of School Education, Pluralism and Marginality argue that school education must be conceptualised keeping in mind the material, social, and life experiences of marginalised groups. According to them, pluralism and social inclusion should be the core principles of the pedagogic conceptual framework, practices and processes of school education across the world. Divided into four sections, this volume brings together international perspectives on education from the USA, UK, Europe, South Africa, New Zealand and Sri Lanka, among others, with a focus on India. It probes into the realities of the formal schooling system and the hegemonies that exclude children of the marginalised communities. It also explores the relationship between school education, labour processes, and differential opportunities and their outcomes. Importantly, the contributors in this volume suggest measures for developing inclusive teaching and learning methods and practices, and present models for culturally responsive and inclusive schooling. This topical volume will be useful for students and scholars of education, culture studies, gender studies and Dalit studies. It will also be of interest to policy-makers and NGOs working in the area of education. Christine E. Sleeter is Professor Emerita, College of Education and Professional Studies, California State University, Monterey Bay,Seaside, CA, USA. Shashi Bhushan Upadhyay is Professor, Department ofHistory, Indira Gandhi National Open University, New Delhi, India. Arvind K. Mishra is Assistant Professor of Social Psychology, Zakir Hussain Center for Educational Studies, School of Social Sciences, Jawaharlal Nehru University, New Delhi, India. Sanjay Kumar is ascholar activist and Secretary, Deshkal Society, New Delhi, India.